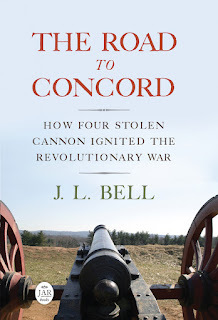 Panel on Washington in Roxbury, 24 Oct.
Talks by Anderson and Kamensky at the B.P.L. Lecture on James DeWolf in Newport, 8 Oct. The Latest Update on Parker’s Revenge, 3 Oct. In South Carolina, two men received appointments under the Stamp Act: George Saxby as inspector of the stamps and Caleb Lloyd as distributor. This appears to have been a way to spread the patronage around. But official news of those appointments didn’t arrive in Charleston until late October 1765, causing some confusion. On 19 October, Charlestonians—“2000 souls” in all, according to the newspaper—went through the ritual of hanging the stamp master in effigy, even though they weren’t sure who that man was. Before burning that effigy on the green, the crowd visited a house owned by Saxby and broke some windows. Later the crowd went to Lloyd’s home, demanding to know if he was going to execute the law. The next day, a Sunday, Lloyd posted a notice at St. Michael’s church in the center of town insisting he hadn’t received a commission—which might have been true, but he probably knew one was on its way. Over the next couple of days, crowds went to other sites, seeking the stamped paper. On the night of 23 October, about seventy men pushed their way into the mansion of Henry Laurens. He hadn’t supported the Stamp Act or sought an appointment under it, but he’d advocated following the law instead of defying it. The crowd demanded the freedom to search Laurens’s house for the stamps. While those men did no more than 15 shillings’ worth of damage, they frightened Laurens’s pregnant wife badly. The next morning, Lt. Gov. William Bull finally announced that the stamps had arrived back on 20 October and were “lodged in Fort Johnson, till it should be necessary for his Majesty’s service to remove them from thence.” Lloyd was probably in that island fort as well, and Saxby joined him after arriving on another ship from Britain on 26 October. A similar situation in North Carolina played out as farce. On 19 and 31 October, Dr. William Houston was hanged in effigy as the colony’s stamp agent in Wilmington, New Bern, and one of the towns that became Fayetteville. Meanwhile, Houston reportedly had no idea he’d been appointed to the job. Dr. Houston traveled from his plantation to Wilmington to meet with Gov. William Tryon on 16 November, only to be greeted by a crowd of three to four hundred men. They demanded that the physician resign his appointment, which he did, and then repeat that resignation in writing at the courthouse. As for the stamps, they didn’t arrive in the colony until 28 November, nearly a month after the law was supposed to take effect. Likewise, as of 1 November, the small colony of Georgia had seen no stamped paper, no stamp master, and no anti-Stamp Act demonstrations. Thank you for this fascinating post. I am a descendant of Dr. William Houston and am familiar with this story, but had not seen the marker. 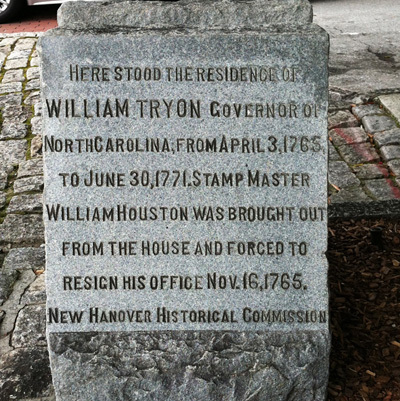 There is another marker in Wilmington, NC. I'm curious if your research revealed more about the location of his plantation outside of Wilmington. I don't have any more info on Dr. Houston. Too far from New England, I'm afraid.